It's Competition time at Valley Paint! Do you have a room in desperate need of a makeover? 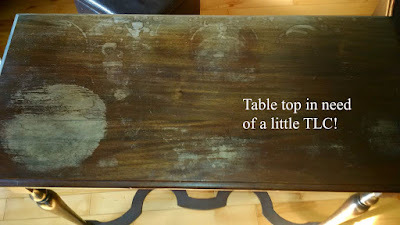 A piece of furniture that's just plain worn out and begging to be painted? Something that is in dire need of a bit of colour magic? We want to see your pictures of ugly stuff!! All you need to do is go to our facebook page , 'Like' our page to enter and then post a picture of your 'Ugly Anything'! The picture with the most 'Likes' wins! So get your friends to go like our page and vote for you by liking your picture! To keep things fair we there is a limit of one entry per person. 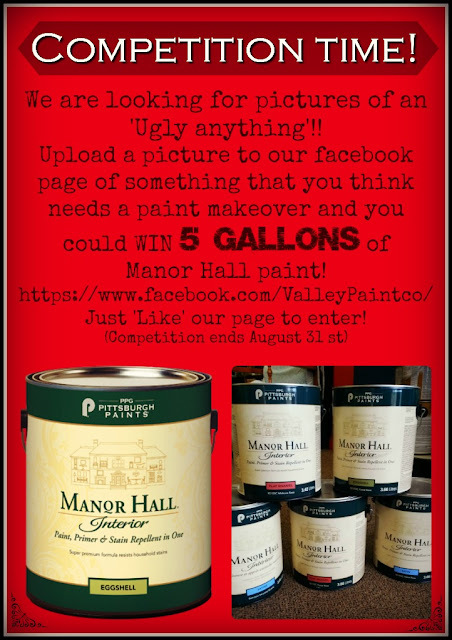 The prize is an amazing 5 gallons of Manor Hall paint!! and can be tinted to any colour of your choice. We're looking forward to seeing what pictures you have to share with us, so fire away, lets see your Ugly Anythings! This is what we started with! This is one of those jobs you can do in a spare couple of hours, and have a very rewarding result! So don't kick that old piece of furniture to the curb...you can bring it back to life and make it look beautiful again with just a few easy steps. Make sure you use gloves during application as this is a strong chemical containing Methylene Chloride. Use a mask and work in a well ventilated area. Basic latex gloves are fine. 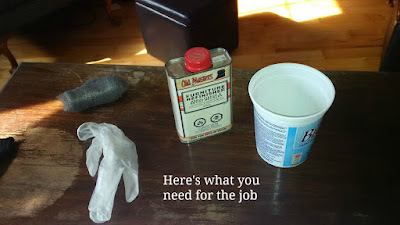 We poured the liquid refinisher into an old yogurt tub to make it easy to dip the steel wool in. The dark liquid is the old dissolved finish. You should end up with something that looks like the above. Now you can apply your chosen finish. 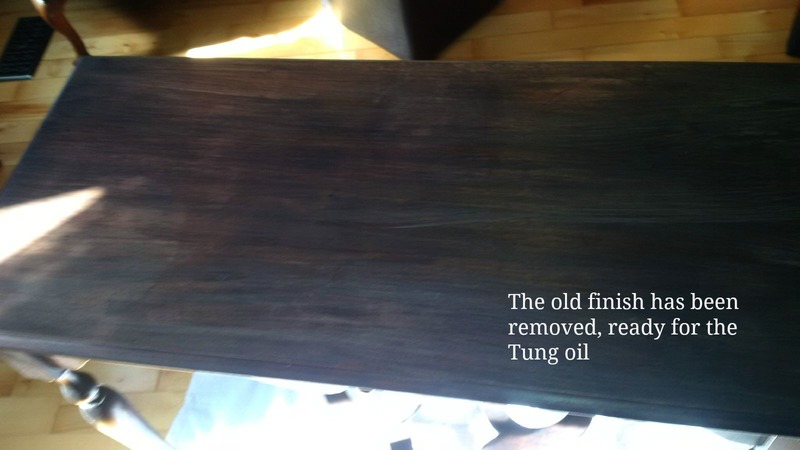 We decided to use Tung Oil, which you can find out more about here to bring out the natural beauty of the wood. 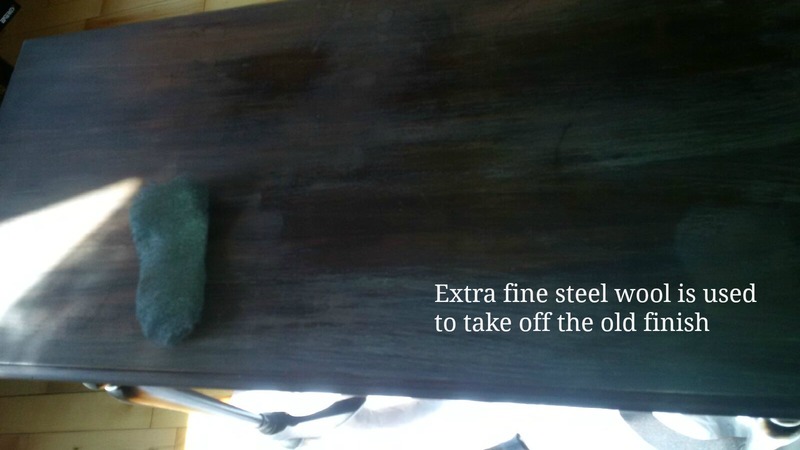 This mirror like shine was achieved with 4-5 coats of Tung oil with sanding between each coat. And there you have it! 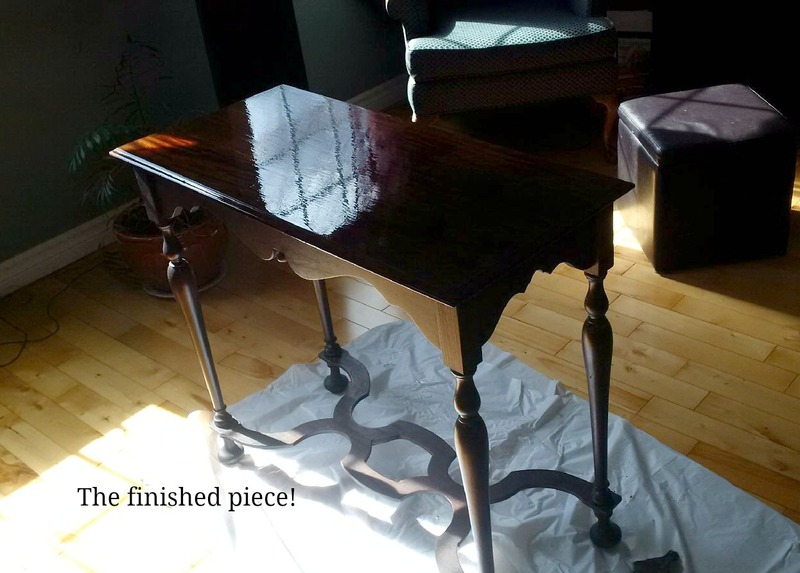 An afternoon's work and a whole new table! Drop by or call us at the store if you need any advice on your own furniture makeover, we're always happy to help! Cheap versus premium paint - what's the difference? What makes expensive paint so much better?? We get asked this question a lot because of the premium brands that we carry at Valley Paint eg Benjamin Moore, Dulux and Pittsburgh paints. To answer this we need to look at what goes into paint and how this affects the price, and that brings us to the question of..... what exactly is paint? Paint is magic in a can isn't it? A sort of wonderful, scientific technicolour magic. Binders are 'the glue that holds it all together' providing adhesion, integrity, and toughness to the paint film by, as the name suggests, binding the pigment together. The binder affects application properties like flow, leveling, and glossiness - its job is to impart adhesion and cohesion. Pigments are granular solids which provide paint with its most important characteristic - colour and opacity. The pigments used in paint are fine solid particles that are dispersed in the binder and solvent. Solvent is a volatile liquid used to obtain viscosity and flow of the paint. It keeps the solid components of paint in suspension and then evaporates after the application of paint to leave a solid dry film on the surface. As paint dries the solvent dissipates and you're left with the pigment and binder. 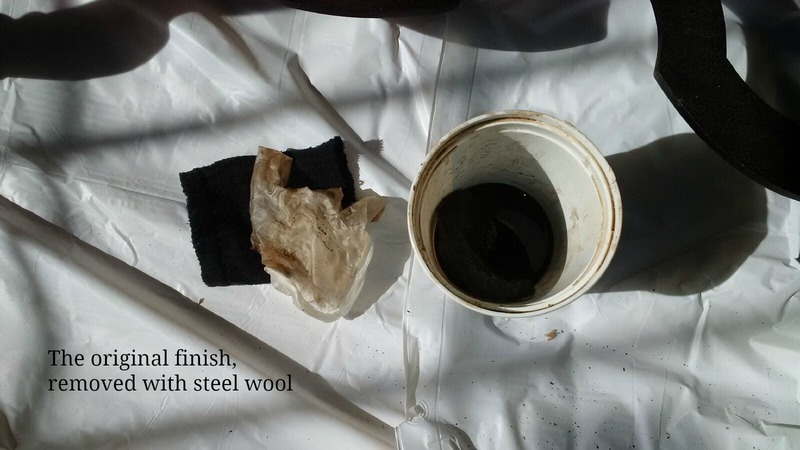 The binder holds the pigment together and the two together create your paint film. Right, that's the technical bit over. Thanks for hanging in there. The part about the pigments was the most important bit because this is where the main difference lies between premium and cheap paint. One of the reasons a paint will cost more is because of a higher pigment content, and pigments are the critical component in paint because obviously they provide the colour! * High quality paints contain a dense concentration of fine particle pigments, and they use Titanium Dioxide as a pigment. * Cheaper paints have fewer and larger pigment particles in the form of fillers. Fillers are other types of pigments such as clay, zinc oxide, silica, and talc, are lower in cost and are found in cheaper paint. They bulk out the product but don't provide the hiding qualities of Titanium Dioxide. What does all this mean to you, the consumer? The higher pigment percentage in a premium paint means you will require less coats to get the coverage. The lower pigment percentage in cheaper paint, means the more coats you’ll need to apply. This results in more time and labour and potentially you could end up spending the same amount of money as you will require more paint! Its ultimately a false economy. When it comes to buying paint the old saying 'You get what you pay for' is especially true! Welcome to the Valley Paint Blog! Hi there! Welcome to the Valley Paint and Coatings blog, home of 'Val your Paint Pal'! 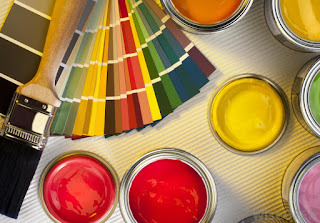 This blog is intended to be a venue for us to share helpful paint advice, handy hacks and other useful tips and tricks.. basically if it's anything at all to do with paint and coatings,we will be writing about it! We will also be answering some of our most frequently asked customer questions, featuring the occasional tutorial, and sharing product reviews - we may be a small paint store but we have lots of big ideas on how to get the job done right! 'Val Your Paint Pal' is our store mascot; he's the little guy with the paint brush and smock, and you'll see him here and there around the blog, popping up on social media and generally being a bit of a nuisance (but we love him anyway) By clicking on Val you can visit our website where you'll find more information about all the products we carry and our contact details. You can also click the icons to find us on Facebook, Twitter and Pinterest. Thanks for stopping by, and we hope you'll check back regularly to see what's going on at the Valley Blog! Meet Val, your Paint Pal! Visit Valley Paint's profile on Pinterest.